Dataflows in Power BI are a really interesting capability for centralizing and reusing Power Query logic among many different PBIX files. If you’ve found yourself copying M scripts (Power Query formula language) between files, or creating a library of M scripts then you should look into dataflows. This post is to focus on what I’m referring to as ‘the three ways to use Power BI dataflows.’ I talked about this on the March BlueGranite Office Hours session on Power BI Dataflows (video recording | slides). In this first option, Power BI handles everything. We use the web-based Power Query Online tool for structuring the data. Power BI handles scheduling the data refresh. The underlying data behind the dataflow is stored in a data lake. However, since it’s fully managed, this data lake is not directly accessible or visible to the customer. As with most cloud-based implementations, the infrastructure is hidden under the covers. This is what is happening if your users are utilizing dataflows currently but you haven’t specified a data lake account in the Power BI admin center. Option 1 above is useful when all of your data preparation is done by analysts and Power BI is the only tool which accesses that data. In this second option, the diagram looks exactly the same as option 1. The key difference is that we have associated our data lake account to Power BI. This is the “bring your own data lake” scenario which means we can actually view the data behind the scenes with a tool such as Azure Storage Explorer (dataflows data is comprised of csv files and the model.json file which contains the schema and other metadata). With this option we are still using Power Query Online and Power BI for the data refresh, so it’s still very business user-friendly in terms of maintaining the data. Option 2 above is useful when your data analysts like using Power Query Online for data prep, but you still want the ability to access the data independently of Power BI. With the third option, we are maintaining the data with another tool such as Azure Databricks or Azure Data Factory. You could even use something as simple as a text editor if you’d like - Chris Webb talks about that in this blog post. Power BI’s role here is reduced to being a consumer of the data. Although Power BI doesn’t take responsibility for updating external dataflows, the dataflow can be consumed by PBIX files like any other dataflow. This is great because the user experience for using the dataflow output doesn’t change. Option 3 above is useful when your data lake is part of your strategic data architecture and is integrated with other Azure technologies**. It is more complicated though because you’re also responsible for managing the metadata in the model.json file which accompanies the actual data files. When you have a balance of corporate BI and managed self-service BI needs, a combination of options 2 and 3 are useful. **Use of dataflows does currently require a filesystem in ADLS Gen2 called “powerbi” so at this point in time (March 2019) we cannot refer the dataflow to just any folder in the data lake. I hope this changes because segregating this data doesn’t lend itself well to a corporate data lake strategy. Also, naming convention junkie that I am…using the name of “powerbi” for the filesystem also doesn’t make 100% sense when there’s other tools involved. I’d rather rely on my normal process of organizing the data lake by subject area and security boundaries. It’s important to be aware that all 3 options can be used simultaneously in the same Power BI tenant. Workspace A is managed by Power BI. If Workspace A is *not* associated to the dataflows storage, the dataflow functionality works normally but data in the lake is not accessible other than through Power Query Online. This is Option 1. If Workspace A *is* associated to the dataflows storage, it’ll be visible in ADLS Gen2. This is Option 2. Workspace B is associated to dataflows storage, and is managed outside of Power BI. This is option 3. 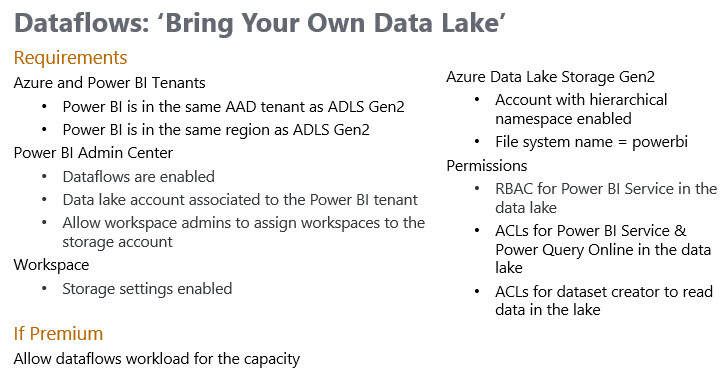 You can only associate on ADLS Gen2 account for your entire Power BI tenant. It requires an ADLS Gen2 filesystem called “powerbi” which means we cannot point to just any folder in the data lake. Once the ADLS Gen2 account is associated to Power BI, it cannot be changed. So be very careful with POCs and such until this becomes more flexible. If the workspace storage setting for dataflows is set to No, then the dataflows in that workspace are using option 1 (which means they still work just fine, you just won’t see the data in your data lake even if you’ve set the data lake account in your tenant settings). If the workspace storage setting is set to Yes, then you are free to use options 2 or 3. At this time the workspace default for dataflows storage is set to No, so it’s easy to forget — I’m hoping that default changes to Yes if there’s a data lake specified in the tenant settings. Now that Azure Data Lake Storage Gen2 is now based on Azure Storage as its foundation, we have a new level to incorporate into our planning process the file system itself. The file system contains the files and folders, and is equivalent to a container in Azure Blob Storage which contains blobs. In ADLS Gen1, we didn't have that intermediary level. I talked about this just a bit in #7 of my recent blog entry called 10 Things to Know About Azure Data Lake Storage Gen2 but I'd like to elaborate in this post a bit more about when you might need multiple storage accounts, multiple containers, or multiple file systems to support your data lake. If you don’t need the hierarchical namespace whatsoever (for non-analytical use cases), this could mean a separate storage account. The storage cost is the same but transaction costs are higher when the HNS is enabled (discussed in item #8 of this post). If your data residency requirements differ for certain types of data (ex: one type of data that must reside within Canada, while another must remain in Europe), that will definitely require separate storage accounts. Settings such as replication (whether it’s locally redundant or geo-redundant) are specified at the storage account level. This impacts not only your disaster recovery planning, but it also impacts cost for the entire storage account. Your two account keys are at the account level, so be ultra cautious in sharing those out. Role-based access control (RBAC/IAM) can be set at the account level or the container level. The container level is the narrowest RBAC scope that can be specified. And don’t forget that RBAC always inherits and can’t be broken: a container inherits from the account, which inherits from the resource group, which inherits from the subscription. You can set up stored access policies which will make your SAS tokens at the blob/file level utilize the policy (such as an expiration date for access). My favorite container-level property is the immutable policy. An immutable policy can prevent data being edited or deleted (i.e., it allows appends only once the policy is enabled). If you have very firm requirements for data protection, this might justify separate containers which have different policies in place. If you have some publicly available data, that access is specified at the container level. If this is an ADLS Gen2 file system (rather than blob container): Power BI Dataflows will reside in one or more file systems. You can set up a SAS (shared access signature) token if you need to make just one specific file available for access. If we’re talking about directories and files within ADLS Gen2 instead of blob within a container, then you would also specify data-level security ACLs (access control lists) at this level as well. ACLs apply to directories and files. From a security planning perspective, it’s really important to plan both RBAC and ACLs. My rule of thumb is to start with a consolidated data lake. Separate out into separate storage accounts or containers/file systems only when it’s justified to do so based on your requirements. The more separation that exists, the harder it is for users to find data — so take that into careful consideration. However…it’s ok to be liberal with the separation of your directory structure within the file system itself. Also, keep in mind that a lot of the RBAC roles are evolving right now with regard to flexibility & granularity of managing the control plane vs. the data plane. Make sure to look into the preview capabilities so you make the best long-term decision. I hope this is helpful for planning out your data lake / data storage needs. A couple of people have asked me recently about how to 'bone up' on the new data lake service in Azure. The way I see it, there are two aspects: A, the technology itself and B, data lake principles and architectural best practices. Below are some links to resources that you should find helpful. When Should We Load Relational Data to a Data Lake? Big Data by Nathan Marz [book] <— This book is getting older now, but the conceptual chapters are excellent. Skip the technology chapters & focus on the concepts & it's a worthwhile read. There are also several books on data lakes. I don’t have a favorite. Just keep in mind that some things are opinions and personal preferences. Though data lakes are maturing, best practices are still emerging. Many articles and book intros overstate the benefits and under-emphasize the challenges, so watch out for that. Since I started focusing primarily on Microsoft BI/DW/analytics around 2005, I've always been happy being a generalist within that space. Fast forward to around 2017 when I started focusing predominantly on Azure. Being a generalist (still within BI/DW/analytics) in Azure is really tough — as I'm sure you well know. Not only is the variety of technologies very wide, the pace of change is dizzying. Handling that pace of change is the subject of this post. (1) Being aware of new announcements, new features, general evolution and maturity of services. (2) Getting hands-on with services and features to build out skills. Related to (1) above, I've been trying to do a better job about keeping up in a timely way. 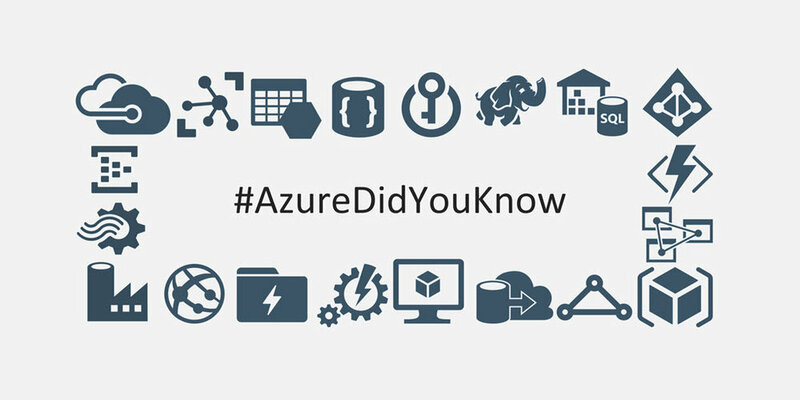 Since January 1, I've been putting out a tweet with the #AzureDidYouKnow hashtag each day (well…most days anyway). It's a way to keep me motivated to continually keep up with announcements...in which case I may as well share them with you as well, right? I do love learning all the time, so this extra bit of motivation helps me keep at it. These daily updates usually relate to something new; sometimes it might be something I just learned, or maybe something I find interesting. **This site is great, but it does not contain every update from every Azure service. If there’s a service you are particularly vested in, be sure to also follow the main product team blog as well. Did I miss anything important in this list related to keeping up with Azure changes? (I did skip general Azure training videos purposely.) If I missed a good one, please shoot me a tweet and let me know.